Let one of our functional Baywood meeting rooms reflect that you mean business. 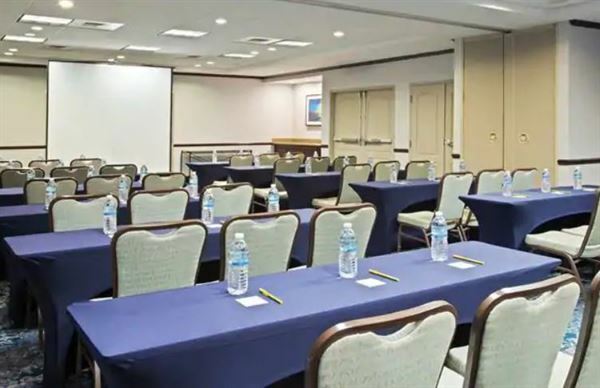 Both rooms are equipped with food service areas that allow your attendees to food and beverage without disruption of your meeting; comfortable chairs and skirted tables with linen; complimentary pens, notepads and ice water pitchers; and access to the latest in audio visual technology. We worry about the details so you don’t have to. We offer a diverse selection of lunch buffet options. Please see our website, or the attachment, for what we offer. A twenty-two percent service charge and applicable state sales tax will be added to all food and beverage arrangements. Please contact us for our complete terms & conditions.